In April 2007 BBC Radio broadcast a profile of the black Guyanese conductor Rudolph Dunbar. Last Sunday (June 19) the BBC rebroadcast a programme about the Moroccan Master Musicians of Jajouka. Both these programmes have strong classical music connections; Rudolph Dunbar was the first black conductor of the Berlin Pilharmonic Orchestra and the 1995 rerelease of the Master Musicians' iconic first album had Philip Glass as executive producer. Yet neither of the programmes was broadcast on BBC Radio 3, instead they were both aired on Radio 4. BBC Radio 3's love affair with the ratings honeypot of Middle England is reflected in a schedule which is increasingly light, white and right. At the 2011 BBC Proms world music is relegated to one late night concert plus two others which are transparent plugs for a BBC TV series. Of course I realise the BBC Proms is not a world music festival. But neither is it a festival of film or children's music, yet alone comedy. Which does not stop all three categories featuring prominently in the 2011 Proms season. 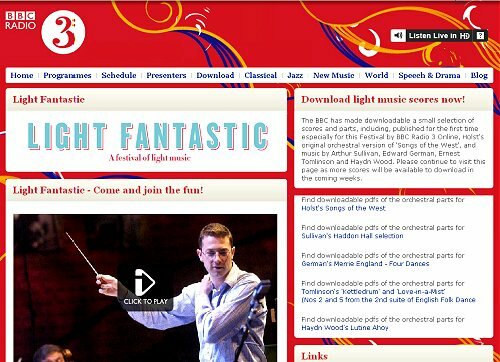 This weekend BBC Radio 3 is turning its schedules over to Light Fantastic, a festival of light music. There is some quite wonderful music in this genre and just a few months ago I wrote enthusiastically about Sir Adrian Boult's recording of the music of Eric Coates and other light music composers. But two and a half days of Merrie England is just too much of a good thing for this particular listener, and it is also a pity that the BBC does not realise that light music exists beyond this sceptered isle. Can we now look forward to Colour Fantastic, a weekend-long celebration of classical musicians of colour? And will it be on BBC Radio 3 or 4? * My in depth features about Rudolph Dunbar and the Master Musicians of Jajouka appeared here some months ahead of the BBC broadcasts. Follow the links to The Berlin Philharmonic's first black conductor and Discord among the Master Musicians. Your suggestion would be quite a wonderful and eye-opening experience for all involved and attending. I hereby volunteer to assist in constructing such an endeavor. If the phone doesn't ring, I'll know it is they.